A hammock can be as simple as some woven rope stretched between two trees, or it can be a massive, built-in ‘outdoor room’ for four people with a price tag of $20,000. 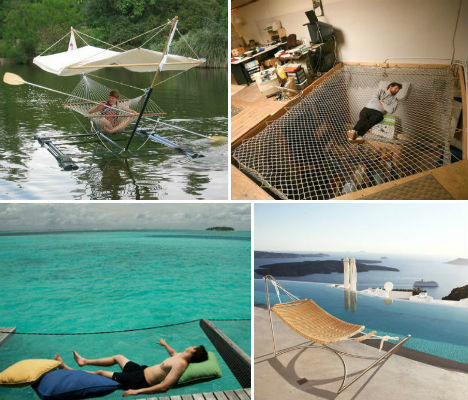 These 13 hammocks run the gamut between crazy DIY creations and amazingly relaxing deck hammocks over water to beautifully designed urban hammocks and luxury loungers for the uber-rich. Spotted at a UC Davis Picnic Day in 2003, this evidently DIY creation is probably the most creative use of a hammock ever captured on camera. 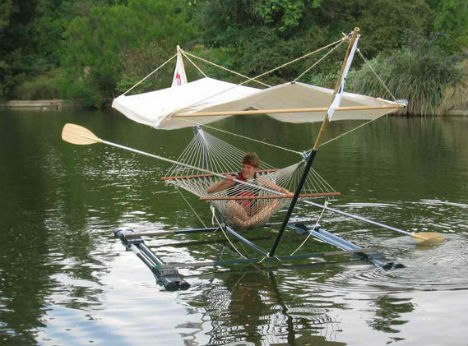 It’s got a sun shade, a hammock for both lounging and sitting up to row, extra-long oars and a floating base that stabilizes the whole thing. 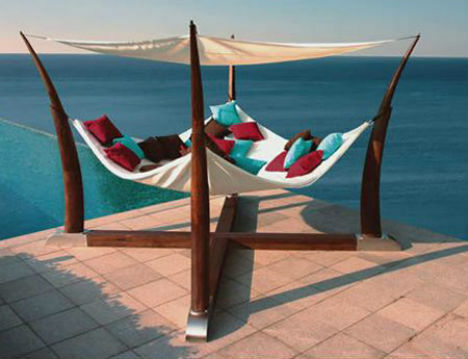 Do hammocks get more picturesque than this? The idea is so simple, but feels so luxurious: simply stretching some net off a deck so you can lay down and relax, and see the water beneath you. 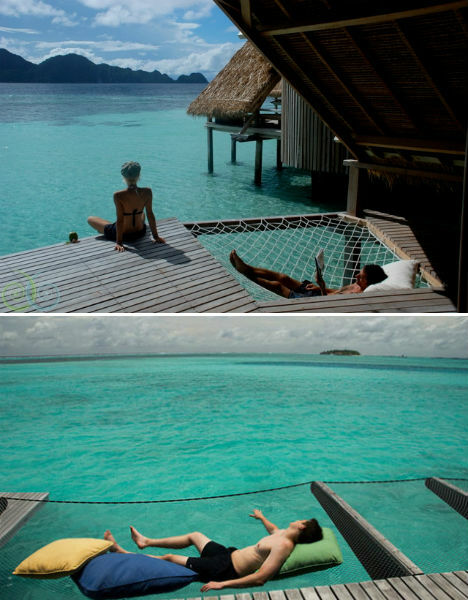 The pictured hammocks are at the One & Only Reethi Rah resort in the Maldives and the Misool Eco Resort in New Guinea. This high-end hammock not only looks really cool and sleek with its steel base, it’s also made with plywood beams that prevent your back from slouching. Plus, it’s got an adjustable footrest and armrests that open when you need them, a pillow and a side pocket. 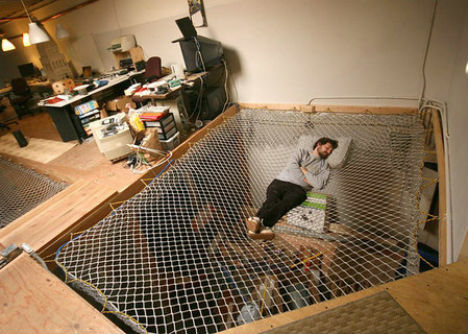 Located inside an office, this hammock bed is probably pretty irresistible for those midday naps. Stretched across an opening in the floor of the second story, the hammock bed resembles a giant spiderweb. 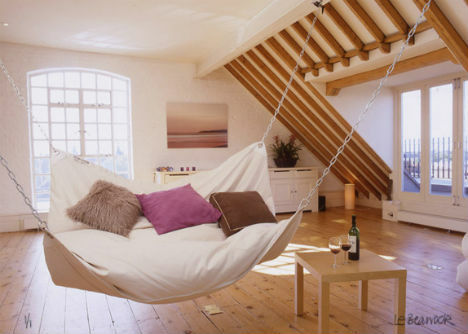 Why have just one hammock when you could have an entire house full of them? 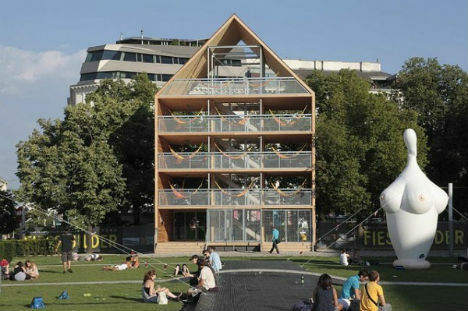 Heri & Salli architects created the Flederhaus as an urban getaway in Vienna, Austria. It’s an open, five-story structure with dozens of hammocks that provide a relaxing view of the park below. Here’s one durable hammock that won’t collapse on you or trap your limbs in its netting. 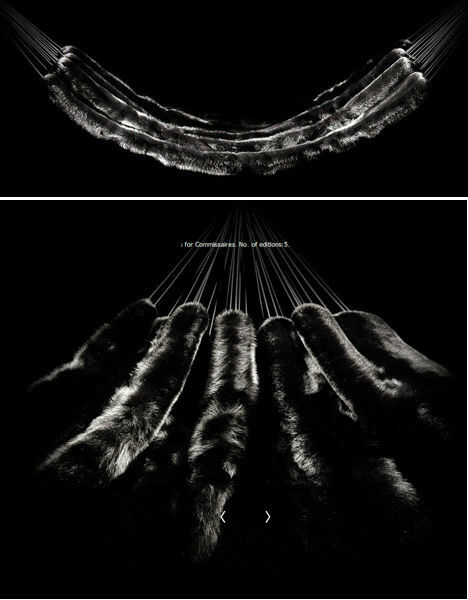 The Leaf hammock by Pinar Yar & Tugrul Govsa has a plastic rim for support, and a woven center for comfort. 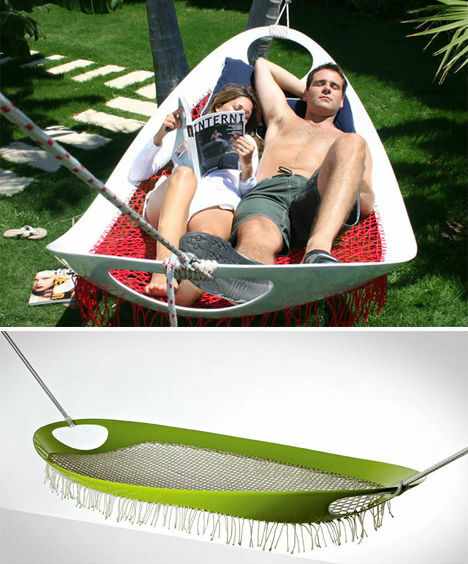 The Cocoon Hammock is certainly inviting, with its large surface that can fit a group, and optional curtains for privacy. Designed by Henry Hall, this hammock is a permanent installation measuring about 12 square feet and weighing over 400 pounds. All of this luxury comes at a cost that nearly equals that of a vehicle: about $20,000. 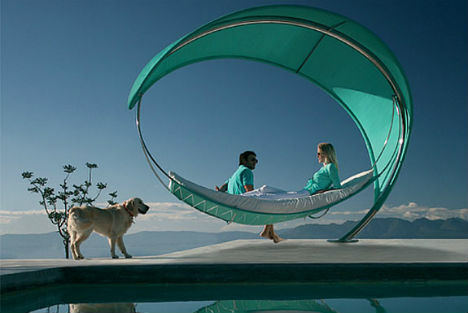 Looking a lot like the sail of a ship, the Wave Hammock has such a small base, it appears to be floating in midair. 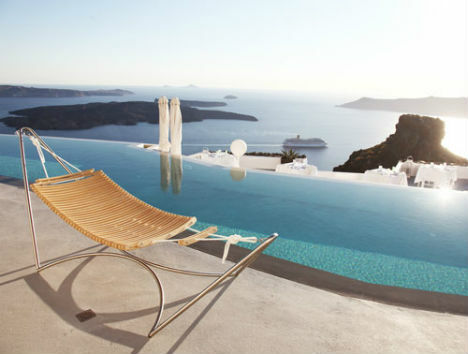 Designed by Erik Nyberg and Gustav Ström for Royal Botania, the hammock has a semi-transparent canopy that blocks 86% of the sun’s rays. 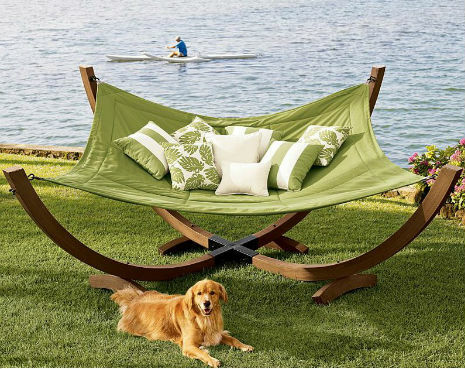 Ergonomically shaped, the Urban Balance Wave Hammock also makes a nice style statement for modern yards and gardens. It’s got an aluminum frame covered in woven wicker and comes with a colorful pillow. 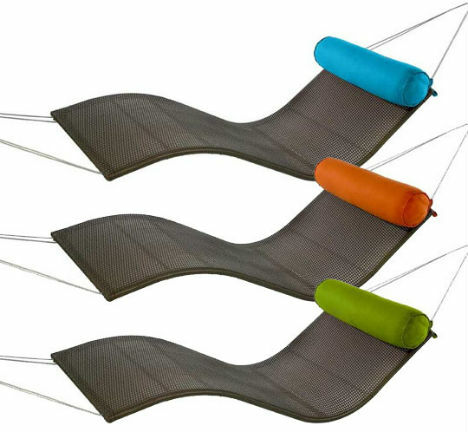 Royal Botania’s E-Z Hammock is another modern choice, this one ideal for outdoor spaces where trees or other hammock supports aren’t readily available. A cross between a bean bag and a hammock, Le Beanock is meant for indoors, and it’s one of the comfiest looking hammocks ever. 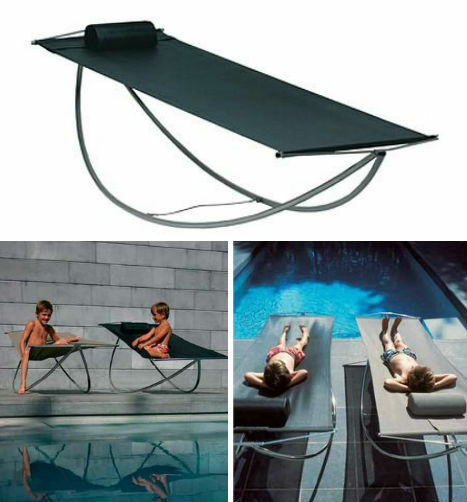 Ranging in price from $200-$500, this might just be the ultimate lounge item for rainy days. Like two hammock frames put together, the Chesapeake four-pole hammock from Pottery Barn easily fits two people in comfort and style. When you’re rich enough to demand over-the-top glitz and glamour in absolutely every object that you own, laying down in a silky-soft fox fur hammock is within your reach. That is, if laying on dead animals is your thing. German design studio Bless created this fox fur double hammock with a dyed fox fur blanket lined with cashmere.